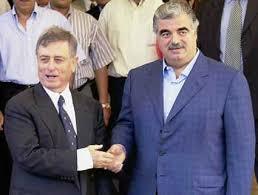 The Muslim Brotherhood has withdrawn from the National Salvation Front led by ex-Vice President Abdal Halim Khaddam. Khaddam is accusing the Brotherhood of doing nothing to oppose the Syrian regime. The article explains that the differences between Khaddam and Bayanouni became clear during the Israeli invasion of Gaza. The Muslim Brotherhood announced during the conflict that it supported the resistance to Israel and stood by its brother organization, Hamas. It also declared an end to its opposition activities in Syria, because Syria was supporting the resistance. In essence, the Muslim Brotherhood was obliged to close ranks with Syria behind its Palestinian counterpart. Khaddam supported Saudi Arabia and Egypt, who opposed Hamas. He also supports the March 14 coalition in Lebanon, who are opposed to Hizbullah, which supports Hamas’ efforts to resist Israel. [Landis addition] The alliance between Bayanouni and Khaddam was concluded in 2005 for strategic reasons that no longer make sense. Bayanouni thought that Khaddam would be able to split the Syrian Baath Party and bring secular Syrians over to the side of the opposition. Khaddam may also have promised that he could bring the support of Saudi Arabia a and the March 14 Coalition in Lebanon to the side of the Muslim Brotherhood. At the time, it seemed that President Bush was serious about destabilizing the Assad government. The formation of both the National Salvation Front and the Damascus Declaration — efforts to unify the splintered opposition in Syria — were both motivated by the belief that the Syrian regime would give way to US pressure. Khaddam saught to make the Muslim Brotherhood acceptable to Washington, but in vain. Ultimately, the US government, although allowing the NSF to open offices in Washington DC, would embrace neither Khaddam or the Brotherhood. Because of Khaddam’s failure to split the Baath Party, win US or Saudi support, or destabilize the Syrian regime, his usefulness to Bayanouni is not obvious. In fact, it would seem that Khaddam has become a millstone around Bayanouni’s neck, for he is disliked by many Islamists as a 30 year ally of Hafiz al-Assad. Also, with Obama pursuing engagement with Syria, the opposition must return to the difficult work of educating average Syrians and bringing them into the fold of the opposition. The Brotherhood’s alliance with Khaddam only muddies their message to the young. The Gaza operation underlined how the two elements of the NSF sit on opposite sides of the larger political divide of the Middle East. HONG KONG (Reuters) – Top Chinese oil firm China National Petroleum Corp (CNPC) is eyeing $5 billion of assets in Syria and Libya held by Petro-Canada (PCA.TO: Quote), a newspaper reported on Monday. CNPC, parent of PetroChina (601857.SS: Quote)(0857.HK: Quote)(PTR.N: Quote), has approached Petro-Canada and Suncor Energy SU.TO — who are in the process of merging — regarding the purchase of the assets, the South China Morning Post cited unidentified sources as saying. In March, Suncor agreed to buy Petro-Canada in an all-share deal, initially valued at $18.4 billion ($15 billion), to create Canada’s largest oil company and the dominant player in the country’s vast oil sands. Petro-Canada’s international unit owns assets in Trinidad and Tobago, Libya, Syria, and the North Sea, the newspaper said. Any discussions regarding the future plans of the combined company would have to wait until the merger is completed, the paper cited a Suncor spokesman as saying. Despite the financial crisis, Chinese state-backed oil giants are aggressively scouring Africa and South America for energy assets to secure supplies and power economic growth at home. look at our opposition, Khaddam and Muslim brotherhood… Syria has no future. DAMASCUS – SMOKERS in Syria burn up about US$600 million on tobacco and cigarettes each year, despite a ban on advertising and smoking in public, according to statistics published on Monday. ‘Smokers annually spend about 26 billion Syrian pounds (US$600 million),’ the state news agency SANA said, quoting a report by an official Syrian tobacco insitution. ‘Each smoker spends about eight per cent of his income to buy 3.6 kilogrammes of tobacco,’ it said. The number of smokers in the Middle Eastern country has gone up by 15 percent, it said without elaborating, despite government attempts to counter the trend. SANA said up to 60 per cent of men and 24 per cent of women still light up in Syria, which has a population approaching 20 million and where nargileh, or water pipes, are becoming increasingly popular. retailers that sell tobacco, the Saudi-owned newspaper reported. reported, citing Syria’s General Organization for Tobacco. Al-Hayat said, citing a study by the organization. What about a shift in the Syrian regime’s stance towards the Brotherhood? The Asharq al-Awsat piece suggests that talks between “high level security officials” form Syria and the Ikhwan have been taking place. Also, al-Moualim made a comment in his recent al-Jazeera interview suggesting that a detente might be possible if the Brotherhood ended its alliances with Syria’s enemies. Syrian Muslim Brotherhood + Khaddam. …. Iran + Hammas. In an ordinary day, those 2 would slaughter one another (like they so enjoy to do in Iraq and Afghanistan). Tehran, wearing her [expressly non-modest] outfit. Wahabi guardian of the 2 holy things in the desert. Israel + Saudi Arabia. For this (really…) I have no words. The following is dated 5 April. A covert program of being the forward outpost for Iran’s military intentions will be the major barrier to a rapproachment with the west that Damascus has been publically seeking for the past year. Strategically, there is very little advantage for Syria to gain from this and very much to lose. LONDON [MENL] — Headline: Iran has increased financing of Syria’s strategic programs. allocations for the continuation of Syria’s strategic military programs. The sources said the programs focused on nuclear, biological and chemical weapons as well as missile delivery systems. Israel + USA. Can you imagine Michelle Obama driving by bus in Jerusalem with those long haired and bearded settler Jews and having to sit in the back of bus because she is a woman? Israel + EU. Can you imagine any European foreign minister being able to hide their smile when they have to sit together with Lieberman and listen to him? Do not worry Amir about the Arab / Muslim alliances. Worry about Israel’s alliances. Soon you do not have any allies left, well besides Burma and some million extreme Christians in the Bible Belt. How can the Mufti makes laws , I thought only the president or the parliament can do that. Or is that a Fatwa. Congratulations to the Syrian people. They are catching up with the Saudis on the issue of smoking. Abd al-Wahhab issued this fatwa over 150 years ago. Waterpipes however have an Iranian connection. So Hassoun could be upset with the Iranians and trying to severe ties just like the King of Morocco did recently!!! another reason why Khaddam must have been a millstone for the ikhwan is that nobody in Syria likes him or takes him seriously. It isn’t only Islamists who are uncomfortable with him. Remember him lecturing the regime about corruption? What a grotesque hypocrite and opportunist. To an extent Syrians accept the corruption of their leaders in return for security. When one of the most corrupt then starts working with the superpower to destabilise and endanger Syria, what reason would anyone have, whatever their ideology, to support him? This sounds like a FATWA, which is exactly the Mufti’s job. I believe that he is relying on a stricter interpretation than common from Syrian Muftis. Muslim scholars, as well as non-scholars, have argued for years about smoking and whether it is Makrooh or Haram, with hanbalies including wahabis banning it outright, not necessarily out of its harm but out of it being a “western bed3a” thing. This is the first time the Mufti of Syria gets in on the discussion. However, in Syria, being a secular country, his fatwa carries more of a guidance weight, and will impact only the very pious, most of whom already avoid it as Makrooh. in KSA, and despite of banning it by Abdelwahab, whose fatwas, including stupid ones, are treated as laws, smoking is still a pandemic. Actually, the recent hukka craze, started in KSA before anywhere else where the Egyptian “muassal” was extended to fruits and other tastes. I’m really impressed by your knowledge about Muslim sects (seriously there is no implied sarcasm). I would appreciate it if you would come up with an elaborate article/comment about this subject. Let’s benefit from your deep insights. He was Ibn Abdel Wahab ,Abdel Wahab is the famous musician and singer. A fatwa has probably more chance in cutting down smoking in Syria than any government law. Gunfuz, you think he should have kept silence and cover up his theft and others, I think even if he was jealous because he could not collected as much as others, still his mistake is a good thing for the country. So, I disagree that no one takes him seriously; I think he was valuable in uncovering himself and others and I wonder why some educated Syrians keep silence about this when it is not 10% of the budget we are talking about but 20 times the budget. The national theft is very important for the future of Syria, it is not a trivial thing, the scale of theft is unprecedented in the history of social countries, and it is a big hurdle in the progress of healthy economy as Dr. Dalilah mentioned 8 years ago and it will not go away. When the new issue of the 100 richest people in Syria published recently, there were no mentioning for Rami Makhloof or any of those billions dollar thieves, at all! How should we think of that? Thanks for the correction. I was accused of knowing more than I really do. Can you please pitch in on this thing. I trust your knowledge of Islamic thought schools, way more than I trust mine.